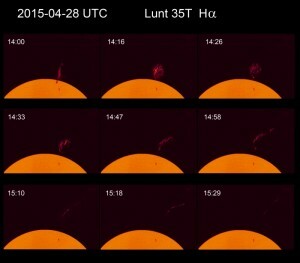 On April 28th, I had the opportunity to follow the evolution of this very nice and long prominence. That was made using a very small Lunt in Halpha (35mm) the total sketch time was less than 2h. The full view sketch was made using black pencils HB and 4B on white paper and with the help of transparent paper for the active zones, inverted while scanning. For the sun’s “comic” I sketch only on white paper with a HB pencil, I had no time to sketch more details and the other details were quite calm facing the prom evolution. This kind of exercise is interesting because no space probe, nor camera are programmed or able to send us such a big number of photo’s and so quick. Let’s say this is another evidence why sketch is still an interesting technique, as is ASOD !. The filament, origin of this prom is visible on the main sketch and on the first one of the sequence, after that the filament disappear. At the end I just add a digital color layer to my sketch with the use of Paint.net. Thank you to you all for your interest and on top of that thank you to the ASOD team for their work. Fantastic sequence of sketches showing the dynamic activity of our Sun. What an exciting capture! A spectacular set of solar sketches. Just a pleasure to look them. Always so nice to see your work. 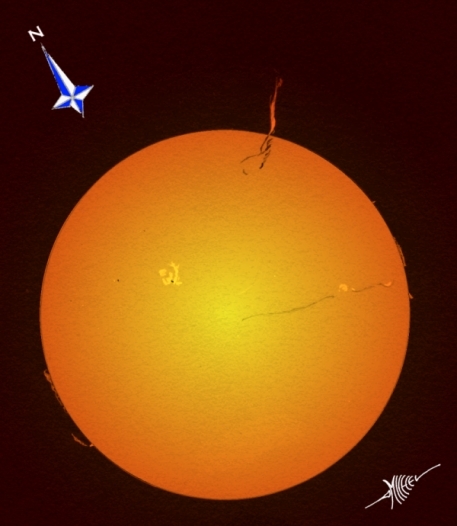 Beautiful solarsketches With an interesting sequence of the Activity! Excellent rendering of the evolution of the solar prominence! Congratulation!! I enjoy Your work. Thank you Cindy, Frank and Per-Jonny and to all ASOD lovers!